The lake level peaked in May, then dropped thru Mid July, and has been rising ever since. It’s now back to the May peak – and we still have Sept and October ahead of us – the peak of my official hurricane season. A decent tropical storm can drop 8-12” so there’s not much margin at this point. Speaking of which, there’s one aimed at Miami right now. I’m ready. Got my generator fueled and about 20 extra gallons of non-ethanol gas; chain saw oiled; batteries installed in the flashlights and lanterns; 2 full propane tanks for the Holland and good rope to tie up the loose stuff on the dock. I know the generator works because Simon and I cranked it up for a few hours back in May to run the chain saw and I know the flashlights worked because we lost power for a few hours a week ago. They worked but were too dim to be useful which is why I knew they needed new batteries. I’m guessing this particular storm, Erika, is not going to amount to much for us but no sense not being ready. Last week there was a seed swap at the Ormond Beach library. I’ve never been to one but thought it might be interesting and I could perhaps learn the best way to preserve seeds. I decided to combine that trip with surf fishing- which turned out to be a bad move. The fishing was fine – great weather and a few small fish. I left the beach and headed for the library. I was inside for less than an hour but when I came back to the car, I noticed that the tip of my very best surf rod was drooping badly. I pulled it out of the car and sure enough, it was broken about 6” down from the tip. Other than a very good fly rod I received as a gift, this surf rod was the best rod I’ve ever owned and will be difficult to replace. I took it to a rod repair shop and the guy told me that not only was the tip broken but it had a slight, but noticeable twist so the guides didn’t quite line up. He said he knew what had happened to the rod – “you left it in a hot car”. And I did. Apparently graphite rods and hot cars are a bad combination. It can easily get over 120 degrees in the sun but still I wouldn’t have guessed heat would be an issue. Plus the seed swap turned into a bust – a bunch of little ole ladies talking about flower seeds. When I mentioned that I was only interested in veggies several noses turned up to the sky. One lady said there was a seed packet labeled cucumbers and I asked what kind. Blank stare. I said thanks but nobody would ever just plant a random cucumber seed without knowing something about it. Is it a pickle cucumber? ; lemon? ; Armenian? ; Burpless? I lasted about 5 minutes. It looks like my ice maker theory is fact – the more ice in the bin, the faster it produces new cubes. I did a 100% dump the other day to load a cooler for a trip to Sam’s. When we got home about 8 hours later it looked like it had made one or two new trays. That compares with about 1 hour to make a tray when the bin is nearly full. That gives me a clue as to why the temp setting may have been changed initially – to accelerate the ice making process. I’m tempted to do that but decided to leave well enough alone. I attended a fall garden seminar at the local Ag Extension service and learned that there’s a lot of things I’m doing exactly right; and some things I’m doing that are exactly wrong. Or maybe the science hasn’t caught up with me yet. It generated about 2 days worth of new work but I’m right up to speed. According to them I don’t use enough chemical fertilizer. My garden is about 1200SF and I use a 50 lb bag over the course of a couple growing seasons. And I just use a standard general purpose fertilizer without benefit of extensive soil testing to determine what’s really needed. Well it’s not exactly correct that I use standard fertilizer – I juice it up with epson salts, bone meal, match heads, egg shells, and sugar. I didn’t give up my magic formula – not sure the master gardener I was talking to was mentally prepared. My composting program is right on target and my soil looks better than theirs. They did tweak my interest in hydroponics and a technique for growing veggies in a bale of hay. I successfully raised hydroponic lettuce in Utah during the winter months so I know that works. These folks had a technique that used a kid’s wading pool as the basic water container. Might try that but I doubt it. The hay bale is really interesting and I plan to dig into that a bit deeper. George came over this morning to tell me about a bear attack on his bird feeder last night. I had noticed that my neighbor on the north’s trash can was knocked over but thought maybe it had blown over in the storm that came through yesterday. My own trash can was right where it should be. Later in the day I went out to the front deck and noticed that our concrete statue of a boy with a fishing rod was knocked over and broken into three pieces. That statue is fairly substantial and probably weighs 50 pounds so it took a fairly good knock to break it. Had to be the bear. I talked to Andrew, next door, and he said he saw two bears the night of the attack. It was about 10PM when he heard his trash can get knocked over and went out to see what was going on. I was ambivalent on the newly enacted bear hunting season but now I’m wanting them to substantially increase the quota. We’ve got to think twice about going out at night into the ultra dark. There are lots of critters wondering around in the night and you really can’t tell the difference between a bear or an armadillo walking in the brush. I don’t know if the statue can be repaired or not but I have some ideas. I wonder which puts out more carbon into the atmosphere forest fires or coal power plants? Seems to me the EPA should cut all the stupid subsidies for solar power, wind power and ethanol and put that money into forest management or at least more substantial fire fighting technology. Here’s a current picture of the viburnums Si and I cut back to raw sticks a couple of months ago. I’m putting this one along side the ice maker as a total victory. 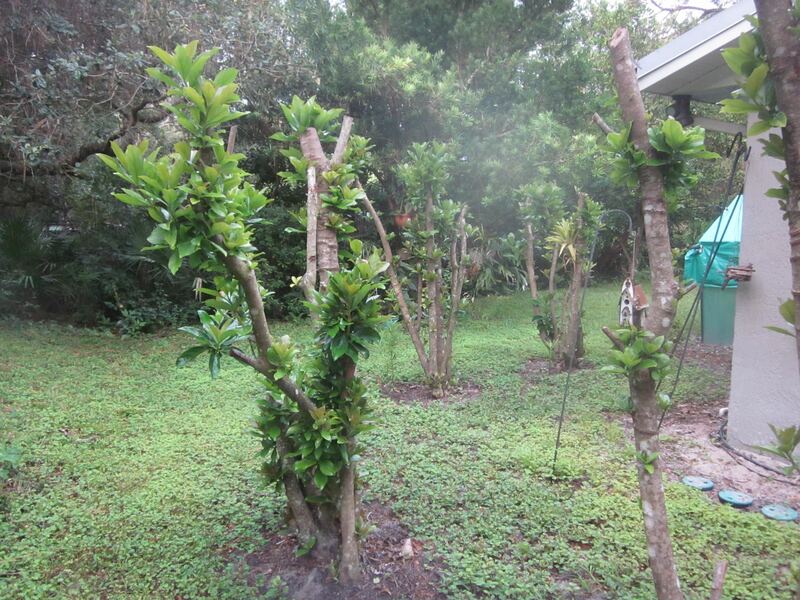 These bushes had been trimmed back to zero foliage – basically stumps – and we had some concerns that they were goners. We’ve soon got to decide whether to just let them grown untrimmed into bushes or cut away the new growth below a certain level – trimming them more into trees than bushes. My carefully thought out fall planting plan had beans, squash, and cucumber seeds going in the ground the first of September. Imagine my surprise reading in the paper that the UF Ag Extension service in Volusia County said those seeds should be in the ground the first of August. Eight hours after reading that, the seeds were in the ground. To me this is too early but then I always have to worry about frost around harvest time. My concern with this early planting is that it’s too hot and buggy. So I’ll go ahead and hold back some seeds and garden space for the original plan. That same Extension Service is holding a seminar the 15th on fall vegetable gardening in Volusia County. It costs $5 to attend but I’ve decided to anyway. The thing I’m hoping to learn is which varieties are best for our area and who knows, I may even learn something else. I’ll be in Daytona that morning dropping Nancy off at the airport so it’s really not much out of my way and the timing works. She’s trying again for Salt Lake. Her last attempt flamed out when the plane was delayed with mechanical problems – enough to miss the connection out of Atlanta. Squash season. never really had decent success with squash here but this past season was decent – the best so far since I started gardening here. I’m giving the quality of the soil credit, recognizing it could have been exceptional weather and/or a lack of bugs. So this fall I’m going into full squash mode with several different varieties of zucchini like summer squash, crook neck, two varieties of butternut, and an acorn. I’ll take out all the stops and plant in well selected spots (I’m not a big squash eater so I usually plant them in less locations) and with my special fertilizer blend. I’ll dig the same large hole and fill it with new compost before planting the seeds instead of just mixing up the top soil a few inches down. In other words, I’ll give squash the full tomato/pepper treatment. As a follow up – I planted the summer squash seeds on Sunday and they had started germinating on Wednesday. It never ceases to amaze me how fast things happen. No signs of the winter squash yet (as expected). They should start popping this coming Sunday. Worked on an interesting project yesterday. George had a septic tank-drain field event last week. Both were the original 1984 installations so they were overdue for some attention. The plan was to have a conventional septic tank pumping using a commercial company and to rebuild the entire drain field from scratch with a few friends – one of whom had a back hoe. I was one of those friends. George had helped do a drain field at his bike club and was aware of a “new” technique that used plastic half circle tunnels, 5’ long, connected end to end in a trench about 3’ deep. The trench was 75’ long. Without the Kuboto back hoe the job would have been impossible since the trench had to be located in a previously wooded area loaded with large, thick roots. It took about 4 hours to clear the trench and maybe 30 minutes to lay down the tunnel. The tunnel was then covered with nursery cloth and the soil pushed back in (with the Kuboto). It was hot and humid but I really wouldn’t call it hard work. I found it surprising that our percolation is so good here that there was virtually no sign of the old drain field. I still think the solution to a screwed up ice maker is to use less ice. I read somewhere that cold drinks are bad for you. My bride disagrees with all that so I made another run at the ice maker last week and noticed that the water tube was totally clogged with ice. I gave it the hair dryer treatment (again), removed the ice clog that was blocking the fill tube, and manually filled the water tray hoping that would trigger a correct cycle. I also raised the temp in the freezer – from setting 3 to 2. It didn’t work – It formed cubes from the water I’d manually added but wouldn’t fill back automatically. I checked again today and found the fill tube was clogged, frozen again. I repeated what I had done before and then raised the freezer temp setting from 2 to 1 to see if maybe that would prevent the ice buildup. About two hours later it dumped the formed ice cubes and automatically filled the tray with water. Promising. I think this was the first time it did the refill itself in recent memory. Is it possible that the only problem all along was the temp setting? Two hours later another batch of well formed cubes dumped into the bin. Two more hours, another batch. It continued to turn out ice overnight so I’m declaring victory. More good news. There’s a house up at the top of our property which had been previously occupied by several migrant worker families but unoccupied for the past year or so. It’s a semi eyesore – not all that bad, but not great. The word was that it was in foreclosure and purchased in some kind of tax deal. It had a realty sign on the road for a few months but that disappeared a while back. I’ve been ok with it vacant since it gave me a place to burn trash and brush. Supposedly it’s been sold and will be bulldozed next week. The property will be consolidated with other pieces owned by the guy way down the other end of the lake and become part of a large pasture on his ranch. That works for me. My fall veggie starts are doing fine. I’ve got about a dozen tomatoes; ditto peppers; and some eggplant. I’ve got starts for Joey and one of Nancy’s quilting buddies too. In the next week or so I’ll do some direct garden planting with squash and beans- not much because it’s on the early side but enough to produce groceries if we get favorable weather conditions. I like to plant stuff a little early, right on, and a little late to cover the climate variables. People seemed befuddled by the number of folks running for president. They’re not all running for president – fewer than half by my reasoning. About half are running for VP and the rest are running for Secretary level appointments. They’ll garner a certain level of support for themselves and then pledge it to one of the real candidates in exchange for a high level position if their guy wins. A Kasich, Jendel, Fiorino, Rick Perry or Ben Carson are in that category (although I think the gov of SC will end up on somebodies ticket as VP. Good choice for Walker since it brings some Southern to his candidacy). I’m involved in an interesting new project. George bought another place on the lake for his grandson. It’s a couple of acres, has a minimal dock, an incredible steel quonset hut, and a small, Jim Walter stilt home. It’s close to 40 years old and somewhere along the way an owner closed in the area under the pilings to add to the living space. I would guess the upstairs, the original home, is on the order of 800SF; ditto the lower level. Upon closer inspection, there’s a fair amount of termite damage and the pilings holding up the structure are rotten. Much of the drywall on the lower level is dampish and loaded with mold. So basically the entire lower level will have to be gutted. It’s a family project but I’m considered part of the family in terms of construction/destruction projects. An engineer is supposed to be coming to see exactly what can be done with the pilings but we have plenty to do tearing out the interior down to the basic wood. Also on George, he’s been having chest pain episodes all week but avoiding the doctor’s office or emergency room. He looked really bad on Tuesday and I thought for sure I was going to be rushing him to the hospital. He made it until Saturday evening where it nailed him at a church event. He thought it was a stent collapsing as it did before or another blockage. If it was the collapsed stent, the doc said they would install another stent inside the one that collapsed. Never heard of that. As it turns out the blockage was in front of the earlier one so they did another stent in the same artery in series with the old one. I talked to him several hours after the procedure and he sounded fine and said he was feeling the same. Probably home the next day. This all seems so casual and routine. Catching more fish lately. I attribute it to a modification I made to the poke boat. One of the advantages I’ve had over my fellow fishermen is that with the poke boat I am super stealthy. It glides over wet grass so I can get back to the inside pockets that others can’t reach without seriously disturbing the area. But with the aluminum shafted paddle and fiberglass gunnels on the boat, it’s really easy to make too much noise when putting down the paddle and picking up the rod. It’s not enough to disturb any normal person but it drives me crazy because I know every bass within 25’ has been alerted that I’m back. I tried several remedies but none would hold up to the environment for more than a few minutes. Then I was out fishing the other day and saw something bright green way back in the shore grass. Turned out to be a styrofoam tube, locally called a swim tube. It’s about 3” in diameter with a hollow core. I cut off a piece about 18” long and slip it lengthwise to the core and was able to slip it over the gunnel. Perfect. Totally deadens the sound and I’m now truly the stealth fisherman. No further gator sightings so I’m guessing the folks on the other side of the lake are feasting on gator tail. Is it my imagination or is this administration the most destructive to our foreign policy ever? Certainly in my memory. All along I attributed it to having a Chicago community organizer as Pres., a lack of understanding, but now I’m thinking perhaps it’s more sinister. Did we elect a Manchurian Candidate? The bad guys have taken his measure and decided there’s never been a better time to make aggressive moves; the good guys have decided it makes sense to put some distance between themselves and us – we’re not a dependable ally. Where I think this is going to get very interesting is watching the Clinton folks – how do they unhook from the current foreign policy. I think they’re going to be dropping hints that the reason Hill left was because she disagreed with Obama’s policies and then start taking them apart one by one. Maybe a trip to Israel is in the cards – billed as an attempt to repair broken relations.